There are still 3 days left when you can take an advantage of Friends & Family Sale Event which is available at PUMA online. Full priced styles are available with 40% discounts. Sale styles are available with an additional 25% discounts. 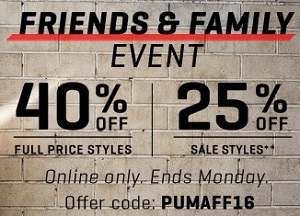 To receive the offer use online promo code PUMAFF16 at checkout. Source of the information is PUMA. The offer expires on 09/19/2016. For more details visit PUMA online.